Hoparazzi was proud to be the main sponsor of the 2018 Tennis Owners & Managers Conference, in Charleston, South Carolina. This marked our first time at the event as well as the start of a year long relationship with the TIA. Our goal is to help promote the tennis industry and youth programs in particular. 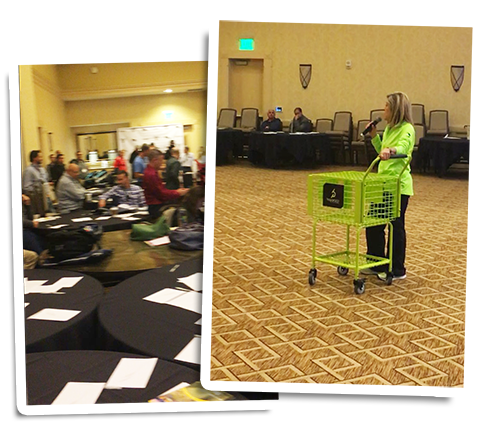 Christi Turdo, President of Hoparazzi and Owner of Glenbrook Racquet Club (in the Chicagoland area) displayed the latest line of Hoparazzi Hoppers to a prestigious group of attendees. The stack-ability, adjust-ability, and portability of our hoppers has set the standard for ball gathering baskets in sports. However, the main emphasis of Christi’s message at the show was much bigger than hoppers. It is clear from the latest TIA data that the growth of tennis in the US has been stagnant, to the point of slight decline, in recent years. This comes at a time when funding for school fitness is failing and children are living increasingly sedentary lives. There is a need for organized activities that keep children moving, starting as early as 2 years of age. But how do you get 2 year olds to play tennis, they can barely walk? The answer is simple….. you don’t. In order to introduce children as young as 2 years old to tennis, the key is to make the tennis club a place where the child has fun, plays and grows. In the same way that a toddler will remember that they like McDonalds (and become a fan for life) toddlers can also remember having fun at a tennis club and thereby become more receptive to playing tennis as they grow older. There are many ways that Tennis Club owners can take advantage of this unique time in our sport. Just like Nick Bollettieri was able to transform the industry, there are opportunities for people that think outside the box to have a significant impact on the game and the success of it’s players, club owners and the future of the sport.